Loved the Gray article. Considering my 45% Romantic/80%SB, wearing all gray feels too “quiet” for me. I guess I could bling it up with pearls, diamonds, and red lipstick, right?! what do you think? You have the right idea. 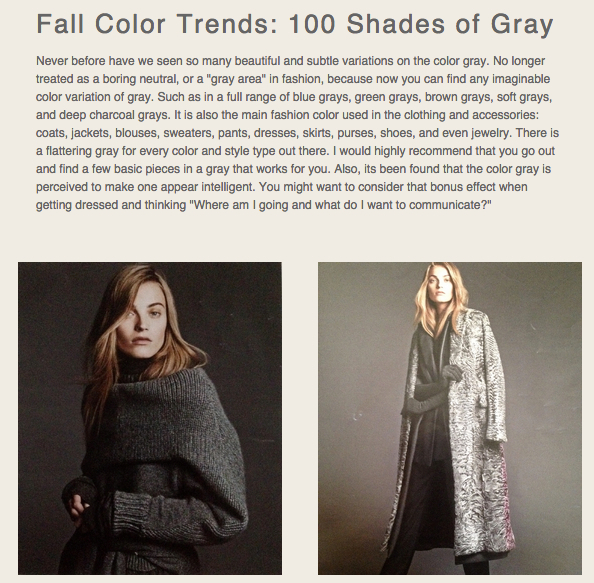 Gray is the perfect backdrop for your subtle blended coloring and romantic style lines. But you don’t necessarily have to “bling” it. That can actually appear “dated”. I would go for a “subtler” approach, don’t worry, your romantic qualities will not be compromised, but enhanced! Try adding a smashing new scarf in your reds or dramatic colors…even an eye extension shade, (I will be covering the return of scarfs soon). Or how about a pair of great shoes or boots. I recently came across an excellent quote in Vogue, from fashion photographer Karim Sadli who said: “Shoes are crucial to a silhouette. I always pay great attention to them, as they can change or twist the whole perception of a look.” Karim Sadli. Oh, and of course always have your lipstick on! And I know just the “merlot” boots I am going to pair with! Thanks!